In many of my recent posts, I have discussed using a continuous glucose monitor (CGM), Dexcom, but I realize that I have not really explained how it works or my journey in obtaining it. Most of the general public, some healthcare professionals, and even some people with diabetes do not know of or understand what CGM is. Prior to using CGM myself, I had some misconceptions about it. It took me a while to finally decide that I wanted to use CGM. My reasons for not wanting a CGM were the cost and having to have something inserted in me at all times. It would be a constant reminder of my diabetes–not that diabetes wasn’t constantly on my mind anyway! After attending a type one diabetes summit in November and hearing many fellow diabetics say that the one diabetes tool that drastically changed their care and that they would never want to give up was CGM (they would rather give up their pump than CGM! ), I began looking into it more. In December, I started the process of filling out the paperwork needed to obtain the CGM. Once I received the CGM, it took me about a month before I finally inserted a sensor for the first time, partly because I was busy with school and didn’t have time to read all the information and also because I was scared to do it on my own. Finally, in the beginning of March, I set up an appointment with the diabetes educator to assist and teach me the proper way to insert my CGM. The above picture shows the device that is used to insert the sensor into the body; I was so intimidated and scared by this device at first! I pull off the white paper on the bottom and stick the device against my abdomen. I then pull off the clear plastic wing. In the round, plastic part, there is a needle inside that is plunged into my skin when I push down on the white plastic part. There are a few more minor steps in the process that remove the device but leave the sensor in place. The above picture shows what the sensor looks like. The side that is shown is what would be against my body. The small wire that is sticking up in the middle is what stays inside my body and measures the glucose level. The sensor is technically supposed to be changed every 7 days, but to save money, time, and pain, many people leave it in longer. The longest I have gone is 2.5 weeks, but usually average about 1.5-2 weeks. So how does the CGM work? Well, as I already showed, the sensor is inserted into the body and measures the glucose. There is a transmitter attached on the outside of the sensor. In the picture, it is the gray piece in the center of the sensor. The transmitter sends the information to the receiver–the pink device in my hand that graphs my blood sugar and shows whether my blood sugar is trending upward, downward, or staying level. I have to be within 20 feet of the receiver for it to be able to receive the information. Contrary to how it sounds, it doesn’t continuously measure my glucose; the glucose level is updated every 5 minutes, so there is some lag time between the CGM and fingerstick blood glucose. The receiver also alerts (vibrates and/or beeps depending on the setting) when my blood sugar is low or high. The user can customize their low and high blood sugar ranges, though there is a preset unchangeable low alert set at 55. I have mine set to 80 for low and 300 for high. I chose 80 because of the lag time; my CGM might say I’m 80 but I could really be in the 60s! Also, if it is highly accurate and it shows I’m 80 when fingerstick shows I’m in the 80s or 70s, it gives me time to have a glucose tablet or something to bring my blood sugar up some and prevent having a low blood sugar. I chose 300 as the high level because my blood sugar often spikes into the 200s after meals, and I don’t want to have alerts going off every time I eat. Once I got used to the insertion process, I absolutely love my CGM and can’t imagine how I managed my diabetes without it! The insertion process was painful at first, and it took me about an hour to rip off the tape and old sensor and insert the new one. Now it doesn’t take me very long at all and doesn’t usually hurt as much. The American Association of Diabetes Educators (AADE) held a summit to identify the best practices in regard to CGM. I identified with many of the benefits they discussed. As I already mentioned, the CGM gives me early warnings for low blood sugar. It also is beneficial because I often have hypoglycemia unawareness, meaning that I don’t always feel symptoms of low blood sugar. This happened a lot at night, so my mom would set alarms throughout the night to come and fingerstick me prior to getting the CGM. Now the CGM alerts and wakes me up if my blood sugar goes low or high. She is now able to sleep through the night, and there have been many nights where my blood sugar is within range and I get to have uninterrupted sleep! Another benefit the AADE identified is insight into the effects of physical activity on glucose levels. My job as a certified nursing assistant is very physically demanding. Now that I have a CGM, I can see what my glucose levels are without taking a break to fingerstick and am alerted if my blood sugar goes low, which it often does! Another benefit is better diabetes management. My A1C has decreased since I started using the CGM. Without it, my lowest A1C was above 7%. With the CGM, my A1C has averaged 6.6%! In my last blog post, I discussed how I was facing diabetes burn out and dealing with my insurance company forcing me to switch from Humalog to Novolog to see how it affected my blood sugar. Well, the fog of diabetes burn out is slowly lifting. But I am still fighting the insurance company to cover Humalog. The insulin dose was calculated to be 7.5 units. One day I took 6 units of Humalog and was 115 at lunchtime. (I have experienced quite a few low blood sugars by lunchtime when I take the full dose of Humalog at breakfast, so I usually take 1-1.5 units less than I calculate to prevent dropping too low, too fast). Another day I took 7 units of Novolog (I could not administer half units with the pen I was prescribed) and was 133 at lunchtime. Both days, I ate the same thing for breakfast, and there was approximately the same amount of time between breakfast and lunch. With my detailed notes and my continuous glucose monitor (CGM) reports showing how my blood sugar control was adversely affected, my doctor decided to switch me back to Humalog. Since switching back, I feel so much better; I don’t feel as burnt out–probably because my blood sugar has been in a much better range! This is part of my CGM report. The left side is when I was on Novolog and right side is when I switched back to Humalog. Huge difference! The yellow bars on the graphs show the times I had high blood sugar, which was practically all day when I was on Novolog. With switching back, my estimated A1C dropped dramatically from 7.4% to 6.8%, as did my average blood sugar. While on Novolog, 44.6% of the time my blood sugar was high, and I was in range only 53.3%. Switching back to Humalog, the amount of time I was high dropped to 28.3%, and I was in range 70.2%–explaining why I feel so much better! The highs I have had while on Humalog have either correlated with meals (darn pancakes!) or to stress caused by nursing school and some other personal stuff. Though I am so glad to be back on Humalog, the fight isn’t quite over yet. Two weeks ago, my doctor sent in a new prescription for Humalog. It is still on hold and awaiting prior authorization/more information from my doctor. I am hoping that everything will go through and that the insurance company will not be able to force me back onto Novolog. Clearly, being on Novolog wreaked havoc on my blood sugars and my mental/emotional health. It is very frustrating to me that the insurance company can dictate what medications I can receive. It is also infuriating how expensive insulin is! Diabetes Forecast had an article about “The Rising Cost of Insulin” that discussed how the pharmaceutical companies and sky-rocketing insulin prices work. The pharmaceutical company sets the price of insulin and confidential negotiations between the company and middlemen (such as drug wholesalers and distributors, pharmacy benefit managers, health plans, and large retail pharmacy chains) are made. The pharmacy benefit managers conduct comparative drug research and develop tiered lists of prescriptions covered by the health plan. If they determine that several insulin products have the same efficacy and side effect profile (as they did with Novolog and Humalog), then the insulin that costs the plan the least will land on a lower tier. In my case, Novolog is on the lower tier. Not all insurance plans are the same though. From being in the online diabetes community, I have seen people who have had to switch from Novolog to Humalog (the opposite of me) because of their insurance. I have even heard of some plans switching back and forth to where the person was on Humalog for a year or two and then insurance switched them to Novolog for a while and then back to Humalog. I think it is ridiculous that profits take precedence over what medication a doctor prescribes. Update: I FINALLY received approval from my insurance to switch back to Humalog, and my prescription was filled! For now, this fight is over! It seems to be that time of year where it is in the air. No, I’m not talking about fall or pumpkin spice…it seems to be the season for diabetes burn out. Recently, many of my fellow bloggers have been describing their experience with diabetes burn out (check out Mindy’s post and Frank’s post). Because of school, stress, anxiety, blood sugar roller coasters, and dealing with diabetes in general, I have been feeling burnt out too. Let’s start with the good news first: I FINALLY started my senior year! Yay! Now the not so good news…unfortunately, the stress and anxiety of school has made my diabetes management much more difficult and my blood sugar has been all over the place. One day the other week, I ate lunch (my blood sugar was in the 120s before eating) and went to class. While sitting in class, my blood sugar spiked into the 300s. I honestly don’t even really remember much of what happened or was said in class that day. I know the topic was endocrine that day, so at least I understand the diabetes portion well enough! After class that day, I had a panic attack in my car. I received a phone call from my endocrinologist office telling me that my insurance company won’t cover my Humalog and that I will need to switch to Novolog. This has happened in the past, but after sending in a prior authorization request, I was still able to receive Humalog. Apparently, this time is different, and the insurance company is forcing me to switch to Novolog at least to see if there are issues in how my blood sugar is affected. But for now they will only prescribe me the Flexpens, which administer whole units. While I am trialing Novolog, I won’t be able to administer my insulin in half units. This may not seem like a big deal, but my body is sensitive enough to the insulin that half units actually make a big difference in my blood sugar control. Thanks insurance company for putting me through much more unnecessary stress, emotional upset, and crazy blood sugar roller coasters! Perfect timing while I try to juggle all the commitments I have with school! This past week I had more blood sugar issues. Monday night after eating my snack I spiked into the 300s. I had planned to go to bed around 1 am and get a good amount of sleep, but diabetes had other plans of course. I saw my blood sugar trending upward on my Dexcom (continuous glucose monitor) and knew that as soon as I climbed into bed, I would hit 300 and have to get back up. So what did I do from 1:30-2:30 in the morning when all I really wanted to do was sleep? I walked on the treadmill for an hour. Needless to say, I didn’t feel that great and was exhausted Tuesday. Tuesday night I had the opposite issue; my blood sugar was low. Last night/this morning I had more issues. I was borderline low (in the low 70s) but trending downward overnight so I treated with some orange juice. I woke up with a blood sugar of 287. Once I ate breakfast, I climbed into the 300s yet again. I didn’t have the energy today to walk on the treadmill or do anything other than lay on the couch to sleep and wait for the insulin to begin bringing my blood sugar down. Usually I don’t like to sleep when my blood sugar is that high, but I have just been so frustrated, exhausted, and burnt out lately, I didn’t really care. I just wanted to sleep! For most of today, I have felt completely worn out and my head has felt like I am in a fog. Diabetes Care, a journal published by the American Diabetes Association, had an interesting article about the effect of stress on blood sugar. This study found that in type 1 diabetics, the effects of acute psychological stress on glucose depends on whether the mental stress happened following food intake or while fasting. They found mental stress after eating caused increased glucose about 30 minutes after being exposed to the stressor and lasted about 2 hours. This would explain why my blood sugar spiked during class the other week; I ate, felt anxious/stressed right before and during class, and then my blood sugar went up. The study also states that chronic psychological stress has been associated with higher A1C levels. According to my Dexcom reports, which show an estimated A1C, the past few weeks since I started school my A1C has creeped back up to 7.5%. At my last endocrinologist appointment in early August before classes started, my A1C was 6.6%. I really hope that this season of diabetes burn out is a short one. I am so tired of feeling frustrated and exhausted and of diabetes interfering with my schoolwork. I hope that I can get my blood sugars in a more normal range soon! I can’t believe today is the last day of Diabetes Blog Week! It has been a great week, and I have enjoyed participating! Reading others’ blog posts and receiving comments on my posts through the week has helped me feel supported and that others share similar experiences. Thank you Karen for your hard work in organizing this week to bring the diabetes online community together and raise awareness! The first tip I have is in regards to low blood sugar events at night. If my blood sugar is low at night, I don’t like to be alone. I want my mom to be aware of it, plus being an amputee, it is difficult to get to the kitchen and get juice while low. So we use a doorbell. We have the receiver plugged in her room, and the button sits on my bedside table. When my blood sugar is low, I just press the button and the doorbell rings. I think of it as being like a call light in a hospital/nursing home. Another tip about low blood sugar events is I use a measuring glass to measure my orange juice and drink out of. It is so convenient because the ounces are labelled on the side, and I don’t have to either estimate the amount of juice poured into a regular glass or measure the juice in a typical measuring cup and then pour it into a glass. As for how I manage my supplies on the go, I used to use bags designed specifically for diabetic supplies. I now use this bag by Hipzbag for my meter. When I go to work or nursing school clinical, I wear it around my waist so that I always have my meter and glucose tablets on me. It is also big enough to fit my phone and keys. For my insulin supplies and glucagon, I use a make-up bag. When I’m not going to work or clinical, I just throw these bags into a purse. With doing it this way, I don’t have to worry about forgetting anything when I switch purses. Another trick I have for not forgetting things is that when I come home, I take my meter and insulin pen out of my bags and leave my bags open on top of my purse. This reminds me to grab my meter and insulin before I leave the house. My final tips and tricks are about my continuous glucose monitor (Dexcom). When I first started using my Dexcom, I used Assured Sports Tape. It stuck very well, and the strips were the perfect size to cut into fourths. The price is great too, as a pack of 6 strips is $1 at the dollar store. However, I have sensitive skin, and the adhesive was a little too good, as I would be left with redness and very sore skin after peeling it off. Also, I only found the tape in red and black, and I didn’t like having these obvious colors show through light-colored shirts. The tape I use now is Nexcare absolute waterproof tape that comes in a roll and is tan-colored. It is very flexible but doesn’t stick as well, which for my sensitive skin is a positive. After a few days of working and showering, the tape starts to peel off but I easily take it off and replace it without disturbing my Dexcom sensor. When I replace my sensor, I always have sticky residue left on my skin. Even after scrubbing and picking at it, it wouldn’t go away. Baby oil takes the sticky residue away in seconds! I can’t take credit for this amazing trick–I learned this from a diabetes group on Facebook. *Note: I am not paid to promote/endorse any products that I discuss. I just share what I have found works best for me! One reason I was so overwhelmed at the event was the amount of information about pumps and CGMs. I don’t think I’ve talked about these in previous posts, so I’ll briefly explain for those who may not know what they are. A pump is an alternate method to administer insulin. Instead of having 6 shots a day, a sensor is inserted into the skin and changed every 3 days. A pager-looking device is used to set the insulin doses which are administered continuously. A CGM also has a sensor inserted into the skin and continually monitors the blood glucose, eliminating the 8 or more finger pricks a day. However, the CGM may not be very accurate, and finger pricks would still be done at least 2-4 times a day. All the information I received at the vendor fair. Lots to read! I use neither device nor do I really have the desire to. However, this was the first time I had really seen these devices in person and had someone explain them to me. Add in the fact that it seemed that EVERYONE who was type 1 at the event was using these devices, I suddenly began questioning my decisions. They are VERY expensive. An insulin pump costs between $4,500-$6,500. It’s attached to me 24/7. A constant reminder of diabetes. Not that it’s constantly there anyway, but when I’m home, my supplies aren’t right at my side and I can somewhat forget for a little while. I don’t trust technology. I feel I have more control giving myself shots than trusting a pump to not malfunction. People have been hospitalized, or at least suffered extremely high blood sugar, from the pump malfunctioning or the sensor bending. I haven’t been hospitalized for diabetes-related problems since my diagnosis (hopefully I won’t jinx myself). I would have TOO much freedom to eat when and what I want. There are times now that I’m just slightly hungry or I get a sudden craving for something but refrain from eating so that I don’t have to do a shot. I would probably snack more frequently and eat less healthy foods while on a pump. Most importantly: I have good control over my diabetes as it is, with an A1C of 7.2%. Why change something that’s already working? Another reason I was overwhelmed was the information provided in the break-out sessions. Those in the professional setting session discussed the working environment and diabetes. They talked about being discrete when testing blood sugar, and most didn’t even tell their employers or co-workers about having diabetes. The topic just comes up when someone sees their medical bracelet or sees them test their blood sugar. 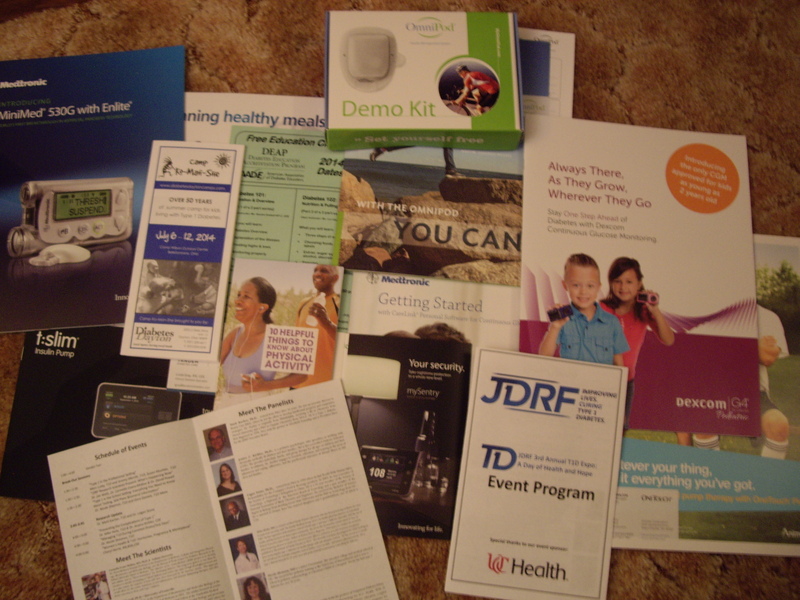 All this made me think a lot about how I handle having diabetes. I’m very open about it and tell people so that 1) I can educate them about diabetes and 2) they are aware in case of a medical emergency. I can’t imagine not telling an employer or my co-workers. I had job interviews this past week, and I suddenly began questioning what I should say, or if I should say anything, about diabetes. Most advice recommends not saying anything about it. But for me, if certain questions are asked, such as why I want to go into healthcare, I’m going to tell. However, last week’s interviews didn’t provide the right opportunity for me to say anything. The last session about preventing complications was a good session to end on. I suddenly went from questioning my decisions about everything I’m doing with diabetes to saying to myself, “I’m doing a really great job, and what works for them, doesn’t necessarily work for me.” Statistics were provided on the reduced risk of getting complications from type 1 with an A1C close to 7%. Information was also provided about the need to not let diabetes control every aspect of one’s life and the need for a strong support system. With that information, I’d say I’m doing a pretty good job! A Type 1 Diabetic trying to get a hold of life. A blog about my life with multiple chronic illnesses... and some other things I like and do mixed in as well. Stumbling through my twenties, with type 1 diabetes tagging along for the ride. Surviving parenting three boys, one with Type 1 Diabetes. Using diabetes as a motivator in faith, fitness, relationships, work, and beyond. Blogging about overcoming personal challenges as an athlete and young person with Type 1 Diabetes.